The £100,000 William Hill Lincoln is the first major race of the Flat turf season and the 2012 renewal of the famous heritage handicap, which takes place over the straight mile at Doncaster on Saturday, March 31, has attracted 97 entries. Sweet Lightning was the impressive winner of the William Hill Lincoln in 2011, coming home two and a half lengths clear of Brae Hill under Johnny Murtagh for owner Andrew Tinkler, chief executive of the Stobart Group. The seven-year-old, who is trained by Michael Dods, has not run since that memorable victory but Tim Jones, racing manager to Andrew Tinkler, revealed today that the William Hill Lincoln is on the agenda again. Sweet Lightning is a 16/1 chance with William Hill . Jones said: “Sweet Lightning is in Dubai at the moment and is going to have one or maybe two runs out there leading up the William Hill Lincoln. We will take it from there. “The reality is that he is now rated significantly higher than he was last year (8lb more) so whether he can go there and carry that sort of weight in the Lincoln or not, I don’t know. There are options at Listed level which we will also take into account. “Very shortly after last year’s success he suffered an injury that he has taken a very long time to recover from, so it is a matter of trying to find out whether or not he has retained his ability, but he appears to be in great form at the moment and the whole idea of last season was to get him ready for Dubai. “I would like to think he has more improvement in him, the other interesting thing is that last year’s race was his first run over a mile for quite some time except when he ran first time out in Dubai. “However, the horse indicated enough to Andrew there that possibly he could be even better over a mile and so he was the one who led the decision-making process to run him in the Lincoln and he looked better than he had ever looked that day. If successful again in 2012, Sweet Lightning would become the first dual winner of the William Hill Lincoln since it was moved to Doncaster in 1965. Ob (1906/07) and Babur (1957/58) were the two dual winners of the race at its former home in Lincoln. 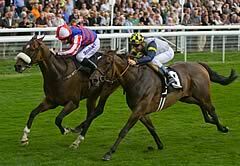 Penitent, a 16/1 chance with William Hill, won the William Hill Lincoln in 2010 and has also been entered. His victory two years ago was for trainer William Haggas but he is now under the care of North Yorkshire handler David O’Meara, having been sold for 40,000 guineas at Tattersalls in October. The William Hill Lincoln has a safety limit of 22 runners and horses that fail to make the cut for the race are eligible to line up in the £40,000 William Hill Spring Mile, which also takes place on Saturday, March 31, over the same course and distance. Eton Forever ran away with the William Hill Spring Mile in 2011 and trainer Roger Varian is planning to send the son of Oratorio back to Doncaster on March 31 for a crack at the William Hill Lincoln itself. He is the current 10/1 favourite with William Hill. The Newmarket handler said: “Eton Forever has wintered very well and, although it is still very early days, he will be on a training schedule to get him to the Lincoln although a lot can happen in the meantime. “He didn’t do much wrong last season. He ran two good races at Ascot but we came away from there, particularly after the Royal Hunt Cup where he was travelling very well two furlongs out, thinking that he didn’t really get the trip over that stiff mile. We think an easy mile like the Doncaster mile or a stiff seven furlongs will be his ideal trip. “He is rated 103 now, which is quite a high mark and he hasn’t done anything to suggest he should be any higher than that, but time will tell if he progresses further this season. Primaeval, trained by James Fanshawe, is the 11/1 second favourite with William Hill and recently confirmed his well-being when second in a competitive handicap at Meydan, Dubai on January 21. 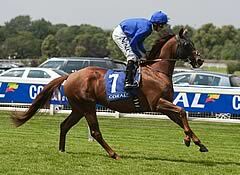 Godolphin has entered Man Of Action, who defeated Eton Forever at Doncaster in September and Start Right. The pair are both 12/1 chances with William Hill. Weights for the William Hill Lincoln will be revealed on Wednesday, February 15. The two-day William Hill Lincoln Meeting takes place on Saturday, March 31 and Sunday, April 1.